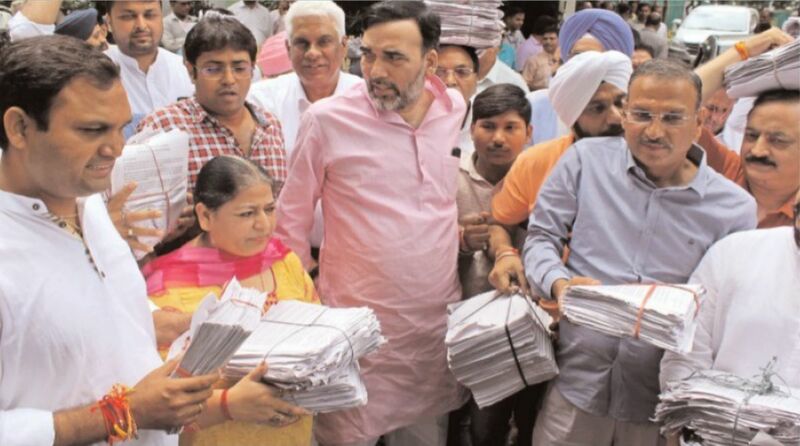 All Aam Aadmi Party (AAP) legislators of the national capital, led by party leader and Minister Gopal Rai, on Monday submitted to Prime Minister Narendra Modi 10 lakh letters with Delhi’ites’ signatures demanding full statehood for Delhi. They first assembled at Chief Minister Arvind Kejriwal’s residence and then proceeded to the PM’s office to submit the letters in support of their demand. A campaign in this regard was started by AAP in July for collecting people’s signatures in support of its demand for full statehood for Delhi. Rai said that during the previous Lok Sabha elections all seven MPs from Delhi had raised the issue of granting full statehood to Delhi. But the BJP-led Central government has taken no step in this regard. A three-day special session of the Delhi Assembly was held in June this year to discuss the demand for full statehood for the city and the House had even passed a resolution in this regard, he pointed out. “We had to approach the people of Delhi as there is no constructive response in this regard from the Centre,” he said.